The cookie diet was invented by Dr. Sanford Siegel in the mid 70’s. Dr. Sanford started practicing medicine in 1957. Unlike many of his colleagues Sanford acknowledged the fact that overweight was related to many of the problems of his patients. He was actively participating in many missions to find methods or diets to lose weight and many of his techniques were effective in their purpose. by the late 70’s he was getting frustrated because of the fact that many of the techniques were based on not eating which lead to a negative impact of hunger which made him think differently. Dr. actually invented a particular amino acid formula which controlled hunger. He chose cookies as the medium to deliver the amino acid formula to people. Later after many years a Canadian doctor proposed for the expansion of the cookie business by opening many franchise. The cookie diet is still works very well on people. Cookie diet is another diet prescribed by many to lose weight. Unlike the south beach diet this diet is crafted to suppress hunger and is paired with a specific dinner. This diet usually just includes just one meal that could be lunch or dinner. The content of this diet which suppresses the hunger are cookies. These cookies are specially crafted and prescribed. These diets usually are of very low calories and many people consider it to be very lacking in nutrition and energy. The lack in nutrition is dealt with by supplementing it with nutrition add on or supplements. The cookies that act as hunger suppressants usually contain amino acids in the form of oats, rice or wheat flour. The cookie diet is equivalent to a brand name for Dr. Sanford Siegel’s cookies which happen to be diet cookies, shakes, nutritional add on, soups etc. Many people will develop a toenail fungus infection sooner or later. Fortunately there are a lot of things people can do to prevent and get rid of toenail fungus. The best way to deal with toenail fungus is to prevent it from happening in the first place. Fortunately there are things that people can do to prevent toenail fungus. Prevention will definitely be the best strategy when dealing toenail fungus. Wearing shoes even sandals at damp places can help prevent toenail fungus. In particular wear shoes at the beach and the swimming pool when you aren’t actually swimming. Wash your feet with soap as you soon as you leave a public place where you might get toenail fungus. Also always wash your hands after touching your feet because toenail fungus can spread to your fingernails. Never wear socks twice without washing them and if possible wash your socks with bleach. Wearing opened toes or sandals without socks can also help prevent toenail fungus because fungus doesn’t like the sunlight. Disinfect your shoes with powder or spray. Another thing to do is to wash your bathroom and any tiled floor in your home down with bleach or another disinfectant cleaner regularly this can prevent toenail fungus from spreading. Washing your feet everyday with soap can also prevent it from spreading. Finally, if you think you’re getting toenail fungus or have been to place where it is common you can disinfect your feet. You can do this by soaking your feet in a mixture of water and vinegar or Listerine mouth wish. Both of these methods can kill toenail fungus. A person can usually tell if they are developing toenail fungus if their toenails are turning yellow, green or brown. Even streaks of yellow, green or brown can be a sign of toenail fungus. So can brittle or thick toenails or the presence of crud underneath the toenails. If you think you are developing toenail fungus your best course of action will be to go to the doctor. In most cases over the counter medicine won’t work on toenail fungus so you will need a prescription. You should try to get to the doctor quickly because if the toenail fungus infection gets really bad the doctor may need to remove your toenail. Soaking your feet in Listerine or water and vinegar can keep a toenail fungus from spreading to your other toes. Treating it with natural disinfectants such as oregano or tea tree oil can also help control a toenail fungus. With all the press this compound continues to receive, it’s hard to imagine that beta-carotene didn’t arrive on the scene until 1932. That’s when researchers figured out that vegetable foods could stand in for animal sources of vitamin A. Initially, betacarotene was overshadowed by vitamin A because the benefits of this colorful compound were thought to be related to its conversion to vitamin A. While vitamin A may confer a protective effect against epithelial cancers, current research suggests that carotene may protect against other types of cancer and heart disease, as well as boost the immune system. The carotenoids are an eclectic array of compounds, and they seem to be intriguing to everyone. Scientists can’t seem to get their research results into print fast enough for a public fascinated by the disease-fighting properties of the carotenoids. Research interest dates back to the first mystery posed by these compounds. Although scientists had been aware that plant foods possessed vitamin A activity, they were stymied by the color of the vegetable tissues when compared to the colorless compound they extracted from liver and animal tissues. Shortly after, they determined that the compound in plant foods was actually a unique substance, quite different from active vitamin A, but one which the body could convert to a colorless form of vitamin A. Closer analysis of plant tissues uncovered the class of compounds known collectively as carotenoids, a generic term for over 600 compounds (of which the liver can convert about 50 to active vitamin A). Only those carotenoids possessing biologic activity of vitamin A are called provitamin A. They all vary in their ability to convert to active vitamin A, ranging from 20 to 60 percent. Five main carotenoids show up in human blood: alpha-carotene, betacarotene, lutein, beta-cryptoxanthin, and lycopene. Food sources of the various carotenoids with some fruits and vegetables higher in specific carotenoids than others. They exist in two different chemical forms, like mirror images of each other, changing to the other forms when exposed to light, heat, or chemical reaction. One current area of study is whether the two different chemical forms work differently in the body. The body isn’t too efficient in absorbing carotenoids, using only 10 to 30 percent, with most being excreted. 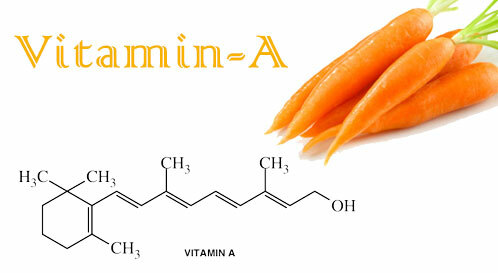 As with vitamin A, carotenoids are absorbed along with and the same way as dietary fat. The amount of fat in the diet has a major impact on how much you absorb, as it does for other fat soluble nutrients. One recent study compared carotenoid absorption rate in a diet consisting of 40 percent fat to one with 20 percent fat. The lower-fat diet, a level not uncommon for health-conscious people, showed a significant reduction in absorption. Other factors that can lower carotenoid absorption include fiber intake, smoking, high body weight, and alcohol. Once inside the intestinal cell, carotenoids can either be converted to vitamin A or be taken up by chylomicrons, the same carriers of the fat you eat, and transported in the bloodstream to the liver. From the liver, carotenoids get back into circulation via other lipoproteins, the same ones that carry cholesterol in the blood. Lycopene, the main red pigment in some fruits and vegetables, is a form of carotene but, unlike its sister compounds, possesses no vitamin A activity. Scientists are excited, however, about its potential protection against cancer. Tomatoes and tomato products are the best sources of this potent antioxidant, although other fruits and vegetables, such as watermelon and pink grapefruit, can be good sources as well. Ironically, not long after researchers first began studying the compound, they realized that people who frequently eat fast foods get more than their fair share oflycopene. The reason is that when tomatoes are processed for ketchup, tomato paste, pizza sauce, and taco sauce, the compound becomes more concentrated. Interestingly, a recent study suggests that not only does tomato paste contain more lycopene than fresh tomatoes, the compound is more available for human absorption from the paste. But what do these colorful compounds, the cartenoids, do besides subsidize our vitamin A intake that has everyone so excited? Originally known only for serving as vitamin A precursors, current research of carotenoids focuses on other effects in the body. The most important effect is their potent antioxidant activity. Take a few minutes to complete the quiz on cutting your risk for a heart attack. The next sections highlight important new research that may offer clues as to how carotenoids may protect against diseases such as heart disease and cancer. When most people think about their immune function, they usually think about a body system that protects them against catching the latest flu or cold bug. While this is certainly true, in a similar way the immune system also takes center stage in the body’s fight against cancer. This defense plan involves a myriad of antitumor activities, and researchers had theorized that betacarotene might act as an immunity enhancer by stimulating some of these processes. Immunology experts and nutrition researchers have long known that the body’s ability to mount an effective immune response in warding off disease depends on nutritional status and, in some cases, specific nutrients such as zinc. So it wasn’t a big leap to consider that individual nutrients might be able to boost immunity. The immune system is a complex of cells and compounds including lymphocytes, T cells and B cells, specialized liver cells, white blood cells, antibodies, and cells that act like garbage collectors in the blood, phagocytes. One important type of immune response, cell-mediated immunity (CMI), is involved in resistance to viral and bacterial infections, certain autoimmune diseases, tissue and organ transplant rejection, and some aspects of defense against cancer. The major players of CMI are T cell lymphocytes because they help make antibodies. The presence of antigens, or foreign particles such as bacteria and viruses, stimulates T cells which initiate CM!. In order for this to occur, a group of compounds called MHC II proteins must be available. The MHC II proteins sit on the surface of some cells and help destroy any type of invader, even cancer cells. We see their importance from studies showing that the degree of immune response is proportional to the level of these MHC II proteins. Recently, British researchers studied how beta-carotene supplementation affected the immune system. The study included twenty-five men who received either 15 mg of beta-carotene or a placebo for twenty-six days. The researchers measured blood levels of compounds that reflect immune function related to tumor development. Beta-carotene supplements caused increases in blood levels of the MHC II proteins. The beta-carotene supplements also increased the level of tumor necrosis factor, which seeks out cancer cells and helps kill them. And the beneficial effects lasted for several weeks after the subjects stopped taking the beta-carotene. The researchers suggested that one way beta-carotene boosts immunity is its antioxidant activity, lowering the level of free radicals and protecting lipids in cell membranes from oxidation; they found higher levels of polyunsaturated fatty acids (PUFAs) after beta-carotene supplementation, which supports this theory. And earlier studies showed that free radicals reduce the MHC II protein. Another reason for beta-carotene’s immunity-boosting power might be related to its effect on prostaglandins, powerful compounds made by the body that regulate many processes including immune responses. Whichever is correct, it appears that moderate increases in dietary intake of beta-carotene can enhance Immune responses. The only problem with the immune effect is that two studies of beta-carotene in the past few years have linked this carotenoid to an increased risk for lung cancer in smokers. In the first study, from Finland, researchers expected supplements to lower the risk of lung cancer, and their results shocked scientists and consumers alike. The current thinking is that other carotenoids may be responsible for the protective effect, with beta-carotene having the opposite effect in people who smoke. Watever the reason, the smart consumer will continue eating fruits and vegetables high in all the carotenoids and skip the beta-carotene supplements.